St Olave's was the subject of a report in An Account of Several Workhouses..., dated May 1729. IN Parish-Street, near the New Church, a commodious Workhouse is erected by the Care and Diligence of the Churchwardens and Overseers of the Poor of this Parish ; and there are now happily provided for in it 50 poor Men and Women, and 70 Boys and Girls, who are employed in spinning Mopp-Yarn, beside being taught to read and say their Catechism. The Steward reads Prayers in the Family twice a Day, and maintains an exemplary Decorum in the House. The workhouse site was the corner of Parish Street and Crucifix Lane (now Druid Street), Bermondsey. In 1733, St Olave's was divided into two and the area containing the workhouse fell in the new parish of St John Horsleydown. Its location is shown on the 1790s map below. St Olave's workhouse Parish Street site, 1790s. 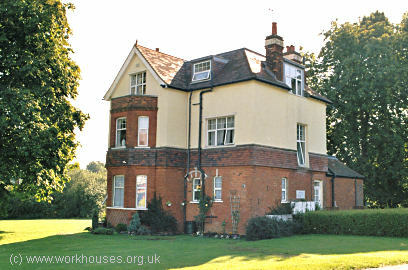 The Parish Street workhouse was rebuilt in 1831. The parish of St Thomas, Southwark, opened a workhouse in around 1734. In 1777, it could accommodate 23 inmates. Surrey: St John, Horsleydown (7); St Olave's (6); St Thomas (2). The population falling within the Union at the 1831 census had been 20,021. The average annual poor-rate expenditure for the period 1833-35 had been £10,617 or 7s.1d. per head of the population. The existing St Olave's parish workhouse on Parish Street was taken over by the new union and continued in operation for many years. Its layout is shown on the 1875 map below. The main part of the workhouse, at the south of the site, was arranged around three sides of a square. 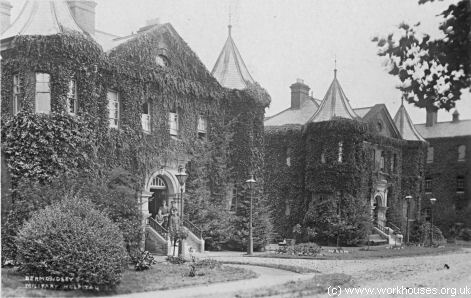 Males were housed in the southern wing, and females in the northern wing, with the dining-hall, kitchens, offices and guardians' board-room at the west, fronting onto Parish Street where the workhouse main entrance was located. The area between the three wings was divided up by walls into yards for the different categories of workhouse inmate. 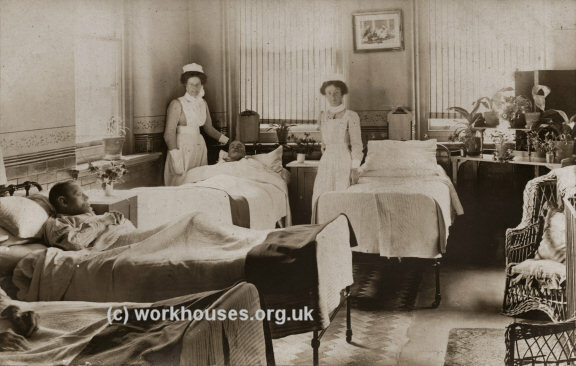 The sick wards northern part of the site, while the workhouse laundry was placed behind the women's wards. St Olave's workhouse Parish Street site, 1875. 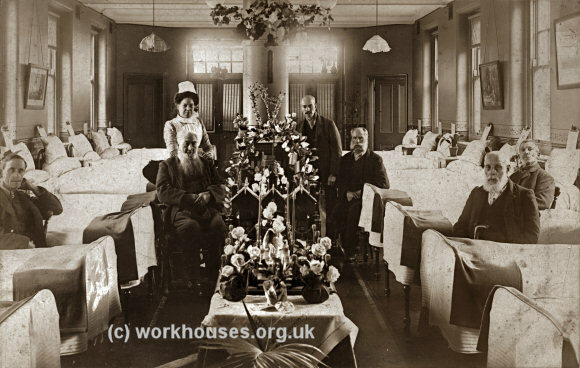 In 1868, the recently formed Metropolitan Asylums Board set up six new Sick Asylum Districts for the purposes of providing hospital care for the poor on separate sites from workhouses. One of the new Districts, named Rotherhithe, comprised the St Olave's Union and the parishes of St Mary Magdalen, Bermondsey, and St Mary, Rotherhithe. However, the new hospital required by the new scheme was felt to be too expensive and, instead, the Rotherhithe Sick Asylum District was reconstituted as an enlarged St Olave's Poor Law Union. The expanded union acquired the existing workhouses from Bermondsey at Tanner Street (formerly Russell Street), and from Rotherhithe at Lower Road. The St Olave's Board of Guardians was required to redeploy its various sites in order to provide satisfactory and separate infirmary and workhouse accommodation for the enlarged union. However, by 1873, no satisfactory plans had been submitted to the Local Government Board who then used their powers to force a scheme on the union. As a result, Rotherhithe was adopted as the site of the union's infirmary and appropriate alterations made. At the same time, the union decided to replace all its existing vagrant wards with new wards on the cellular system on a site on Lower Road adjacent to the Rotherhithe workhouse. In 1904, the St Olave's Union was renamed the Parish of Bermondsey. In 1873-5, the St Olave's Union's new infirmary was erected at the west side of Lower Road, Rotherhithe, on a two acre site to the west of the former Rotherhithe workhouse. The site location and layout are shown on an 1888 map. St Olave's Lower Road infirmary site, 1896. 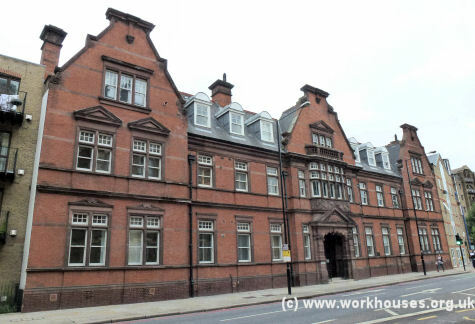 The infirmary was designed by Henry Saxon Snell who was the architect of a number of London workhouse and hospital buildings at this period, including ones for Holborn, St Marylebone, St George's Hanover Square and St Luke's. His proposed design for St Olave's is shown below. The initial phase of construction accommodated 175 patients, although the completed scheme would cater for 400. St Olave Lower Road infirmary, architect's drawing rom the north, 1888. 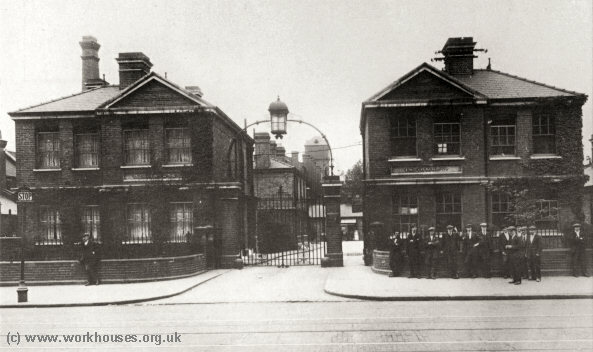 St Olave's Lower Road infirmary entrance, 1920s. 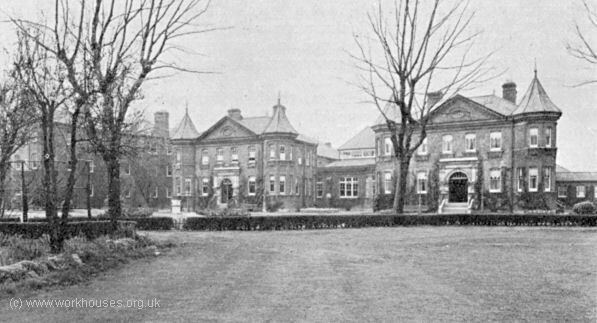 The establishment later became known as Bermondsey and Rotherhithe Infirmary, then as St Olave's Hospital. All the buildings have now been demolished. In 1897-1900, another institution was erected at Ladywell intended solely for the accommodation of the aged and infirm, possibly the only such establishment of its type. The site location is shown on the 1916 map below by which time the establishment had become known as Bermondsey Institution. St Olave's Ladywell infirmary site, 1916. The scheme was designed by the team of Newman and Newman. The entrance to the site was from the north at Slagrove Place. The main buildings comprised a central administration block and dining hall flanked by three double pavilion ward blocks at each side. Four wards were for the "infirm", six for the "healthy infirm" and two for the "healthy aged". Males were accommodated at the north of the site and females at the south. There was also a separate block for six married couples, plus an isolation hospital, laundry, two chapels (Church of England and Roman Catholic) and a water tower. 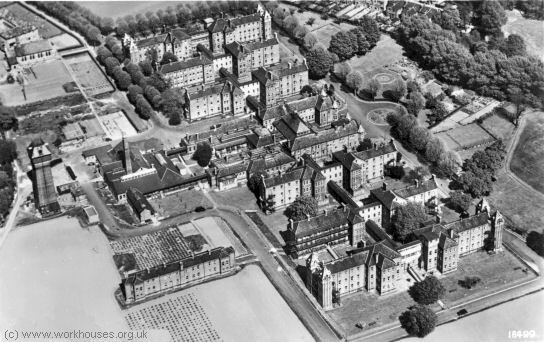 Ladywell Infirmary aerial view from the west. Ladywell administration block and dining hall from the south-east, c.1938. St Olave's Ladywell administration block and dining hall from the south-east, 2001. 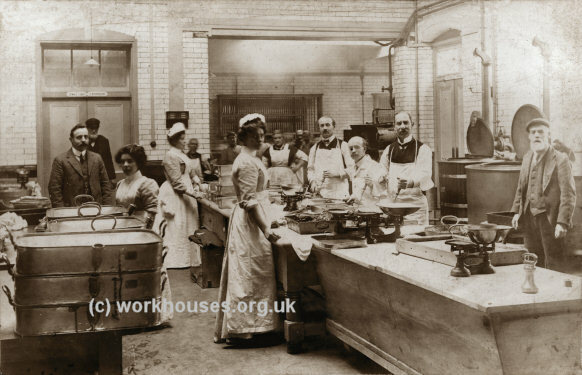 St Olave's Ladywell kitchen, early 1900s. 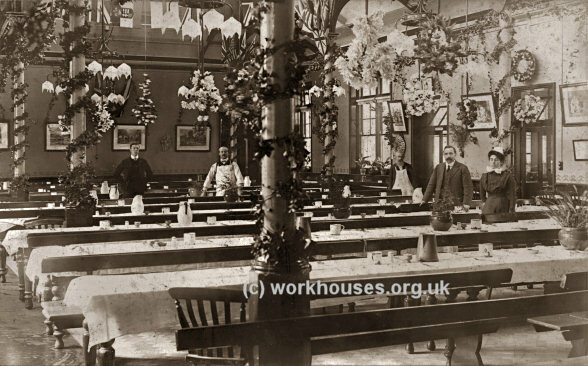 St Olave's Ladywell dining hall, early 1900s. St Olave's Ladywell ward interior, early 1900s. St Olave's Ladywell water tower from the south, 2001. During the First World War, Ladywell provided treatment for miltary personnel under the name of Bermondsey Military Hospital. 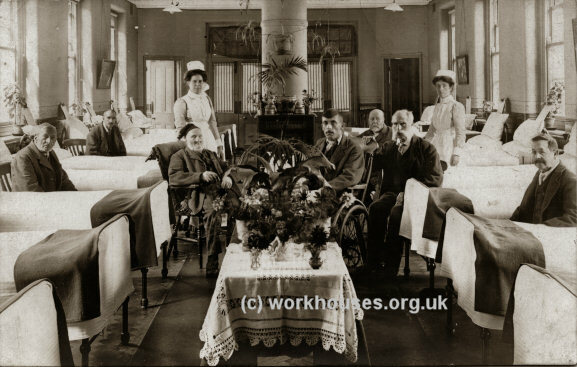 After 1930, the institution was taken over by the London County Council's welfare department and continued in use as a residential institution for the elderly. Most of buildings have now been demolished with the remainder converted to residential use. 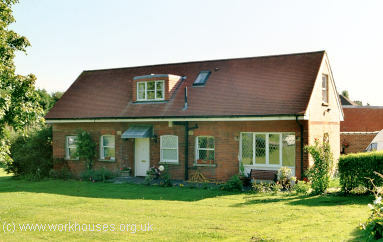 There were 38 children's cottages, making Shirley one of the largest cottage homes sites ever erected. Some children stayed there for just a few weeks, some for up to fifteen years. The number on the roll rarely fell below 400. As well as the children's houses, other buildings included a sick bay, swimming bath, laundry, and workshops. A large school stood at the north of the site. 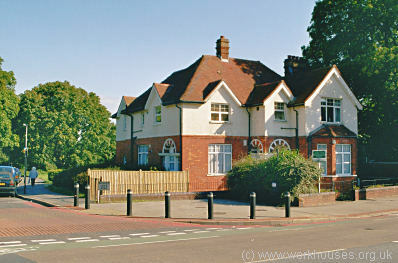 The entrance to the site was at the south on Wickham Road where a lodge was located. 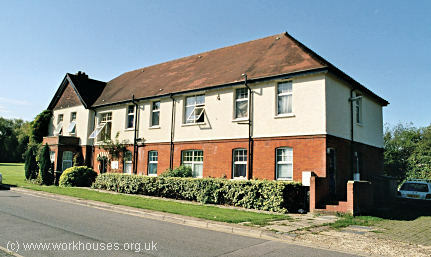 St Olave's — Shirley Homes entrance lodge, 2004. To its north, there was a single-storey block which in later years was used as a store by the estate's painters and carpenters. St Olave's — Shirley Homes, 2004. The children's houses contained around a dozen boys or girls under the care of a house-mother of house-father. St Olave's — Shirley Homes children's cottages, 2004. In 1930, the homes passed to the London County Council which ran them until the London Borough of Lambeth took them over in 1965. The homes finally closed in 1983. The site has now been redevloped for residential use. Several of the original children's home survive. 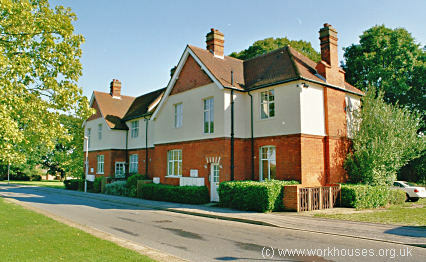 The site of the homes' school, at the north of the homes, is now occupied by Shirley Oak Hospital. The union also established two cottage homes in Peckam at 'Elmside', 180-182 Peckham Rye, and 'The Hawthorns', 43 The Gardens, Peckham Rye, which in 1908 could accommodate a total of 94 children. In 1899, the St Olave's Guardians opened new offices at 283 Tooley Street to replace their existing premises on Tanner Street. The building was designed by local architects Newman and Newman and its construction cost £20,000. As well as offices, the scheme included an out-relief station, dispensary and vaccination station. Former St Olave's Union Tooley Street Offices, 2011. London Metropolitan Archives, 40 Northampton Road, London EC1R OHB. Holdings include: Guardians' minute books (1836-70, 1904-1930); Financial records (1836-1930); Staff register (1848-67); etc. Adams, J and Coll, G (1999) The History of Shirley Oaks Children's Home (London: Deptford Forum Publishing).